The WA Premier Collin Barnett and Fisheries Minister Norman Moore recently announced that the Government will allocate $6.85-million for its 'shark mitigation' strategy, in response to the recent wave of sharks bite incidents in the state. We applaud the Government for allocating $4 million to applied research and tagging programs, as this is certainly the best way to understand the root cause of shark bite fatalities and deter any future incidents. In addition, they have also allocated $500,000 to Surf Lifesaving WA to bolster beach safety and $150,000 for additional community awareness programs. We believe that on the ground work with the local community informing people of the potential risks involved with entering the ocean and how to avoid dangerous situations is a key factor in improving public safety and reducing shark bite incidents. 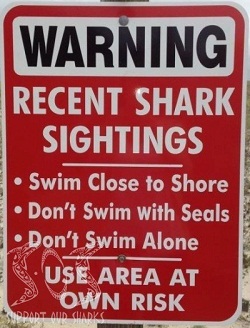 All of the measures mentioned above are extremely positive in terms of both public safety and shark conservation. However, controversially, the Government has also allocated $2 million for a new service to allow the Department of Fisheries to track, catch and, if necessary, destroy sharks (species not specified) in close proximity to beachgoers, including setting drum lines if a danger is posed. The Government is clearly under extreme pressure from a small sector in WA (given a magnified voice by the local media) whom believes that removing white sharks will make the ocean a safer place, even though the WA people are overwhelmingly against shark culling. According to Shark Alarm, a group that monitors shark activity in Australian waters, the state government’s decision may actually cause more damage than good, “People who love the ocean, and who respect that this species is endangered will now most likely refuse to report the sighting at all, in fear that the shark will be killed by the government”. In fact, during the latter half of the 20th century, shark culling was carried out in Hawaii in an attempt to make the waters safer. From 1959 to 1976, the state of Hawaii culled 4,668 sharks including 554 tiger sharks. No significant decrease in the rate of shark bites was detected. Yet here we are 40 years on, again proposing the use of a failed strategy. Pre-emptively killing sharks is simply an appeasement tactic, one of emotion rather than of real science. 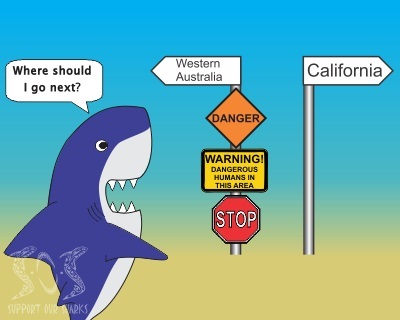 The WA Government is understandably in a difficult situation because every shark bite incident brings the same small group of ill-informed people to the public’s attention by the local media looking for a story that will sell. Even though all the polls (1;2;3) overwhelmingly suggest that people are against killing sharks, sections of the media choose to ignore this and effectively manipulate the views of the WA people to sell their story. It is therefore no surprise that the WA Government has issued an order to kill sharks if they pose an imminent danger/threat, as they probably believe that this is what the WA people want. WA has had legislation (Section 7 of the Fish Resource management Act 1994) in place for many years that enables the Department of Fisheries to kill sharks after a fatality, if they can properly identify the individual involved, yet to date they have never acted upon this legislation. Now they have the option of killing sharks before an incident and so time will tell if they will actually act upon this or whether this is really just an appeasement tactic to satisfy the loud voice of a small group of people and finally bring this issue to a close. We previously ran a successful campaign against shark culling in WA which gathered the support of over 100 of the world’s leading shark experts and over 19,000 members of the public. We stand by our campaign and reiterate that investment in research, and involvement with the local community on how to avoid coming in contact with potentially dangerous sharks, are key to preventing future unwanted encounters. Finally we encourage you to respectfully share your views with Premier Barnett and Fisheries Minister Moore on what you think about their new proposal as they are, after-all, working for your interests. These leaders need to be informed of your views on the matter so they can act accordingly, otherwise they have only the one-sided and potentially biased view portrayed by the media. For further impact we encourage you to check out our petitions page and add your support to relevant campaigns.